UPDATED: JUN 25, 2018 Bottle. Pour dark brown almost black color with medium shortliving head. Atoma of wood, chocolate, cabbage?, dark fruits. In flavor chocolate with dark fruits, biscuit, nuts and light alcohol. Little bit on sweet side. Medium body. Overall: nice one. UPDATED: FEB 22, 2018 Achetée à Hyperboisson. Bière noire avec une superbe mousse. Au nez on retrouve le café le grillé. La bouche est sèche et amère mais soyeuse. Pas génial mais pas mauvaise non plus. Flaske spandert av Rune. Delt med ham og djoeye hos førstnevnte 1 Aug 17. Svart. Mokkafarget filmskum. Sjokoladearoma. Smaken sjokolade & lakris. Lett syrlig. Tørr ettersmak. 330ml bottle, lot 120, bought at Village De La Bière, Strasbourg a few yeas ago. A fawn-coloured head resting on top of a dark brown body. Spotty lacing. Chocolate and caramel nose. Slightly roasted dark malts and dark fruity flavours with a backdrop of coffee. Rounded mouth feel. Medium bodied. Decent. (Joint session with Finn and djoeye, Tromsø 01.08.2017). 33cl bottle achetée en Alsace. Une belle stout bien maltée au final assez sec. 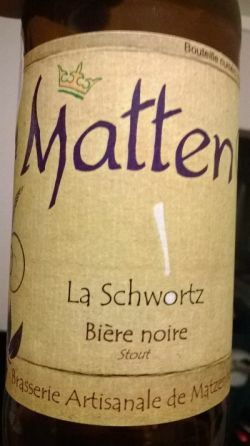 Bottle from Strasbourg Bière Import. Black color with lightbrown head. Nose on chocolate and dark fruits. Aroma of roasted malt with erthy burnt notes. Medium body, heavy carbonation. Nice intro to Stout. 330ml bottle [a Bartlebierian trade item, thanks!]. Black colour with average to huge, frothy, diminishing, minimally lacing, tan head. Roasty, sweet-ish, dark malty aroma, notes of treacle, coffee, dark chocolate. Taste is roasty dark malty, notes of coffee, dark chocolate, roasty and hoppy bitterness. Bottled, 330ml from Nicolas Wines, Strasbourg, France. Very dark brown with tan head. There is a pleasant, rich, fruity nose to this which leads to dark roasted, toasty malts. There are light coffee then toffee notes, some chocolate, some sweetness. Very decent.